This is our most popular half mount replica. 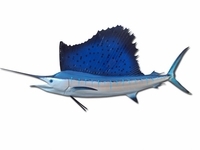 This is a classic posed sailfish measuring 71 inches long by 29 inches tall. This half mount replica was molded from an actual sailfish that was caught in the Florida Keys. The attention to detail, the incredible paint job and the spectacular clear coat finish gives you a truly magnificent trophy. You can't go wrong with this selection.